The AGM-176 Griffin is a lightweight, precision kinetic effects munition developed by Raytheon. It has been designed to be launched from the ground or air as a rocket-powered missile or dropped from the air as a guided bomb. It is intended as a precision low-collateral damage weapon with a relatively small warhead for the kinds of "irregular warfare operations" encountered on battlefields such as Afghanistan where it has been successfully proven in combat. Raytheon developed Griffin as a low-cost modular system, using components from earlier projects, among others the FGM-148 Javelin and the AIM-9X Sidewinder. It was originally designed to be launched from the MC-130W 'Dragon Spear' gunship for the US Special Operations Command. It has been adapted into a gravity-dropped precision munition dropped from a rear cargo-door and rocket-powered forward-firing missile configurations as a short-range air-to-surface missile and surface-to-surface missile which can be fired from UAVs as well as C-130 Hercules transport gunships and helicopters. Griffin has folding fins for tube-launching, with a 5.5 inch diameter. It can be guided either by a semi-active laser seeker or guided with GPS. Its precision combined with a relatively small 13-lb warhead reduces collateral damage. Griffin A is unpowered and dropped by gravity. This air dropped munition weighs 33 lb and is 43 inches in length. It is launched from a 10-tube “Gunslinger” launcher that fits on the rear ramp of a Marine KC-130 tanker/transport that has been used in Afghanistan as an improvised alternative to expensive dedicated gunships. A paratroop door mounted launcher that can drop while the cabin is pressurized has also been developed. The Griffin Block II B is a forward-firing rocket powered missile for helicopter, aircraft and surface launching. It can be selected to engage the target with height of burst, point detonation or fuze delay. The US Navy has tested the Griffin as a shipboard missile guided by laser to score direct hits against fast-moving small boats. It plans to use them on the Littoral Combat Ships. The missile version comprises less than half the weight of a Hellfire round and includes a 13 lb warhead. It has a range of 15 km when air-launched, or 5.5 km when launched from the surface. It has been fired from the US Army Remote weapon station, multi-round Wedge Launcher, Smart Launcher and Kiowa Warrior manned helicopters. 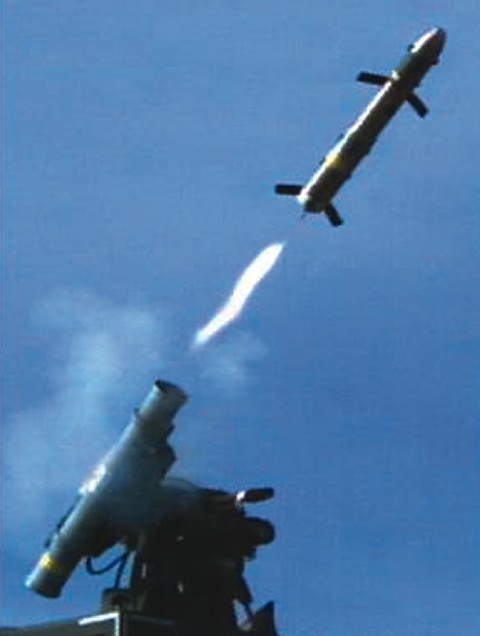 The missile is smaller than the Hellfire typically used by armed UAVs, which has the effect of reducing the potential for collateral damage and three Griffins can be carried in place of one Hellfire. The Griffin missile and launch assembly is also significantly lighter than the Hellfire, allowing more to be mounted on the payload-limited Predator. Raytheon is developing an extended range version of the Griffin for integration onto Littoral Combat Ships. The Sea Griffin will have a new motor and guidance system to increase its firing range from an LCS. Raytheon may face competition in equipping the LCS with a missile, as the Navy is looking for other vendors. Competition may come from MBDA with the Sea Spear version of its Brimstone missile. Both missiles intend to give the LCS protection from small boat swarm attacks. On 27 September 2013, Raytheon and the U.S. Navy demonstrated the Griffin missile's ability to engage fast-moving small boats from various platforms throughout a series of at-sea tests. The MK-60 Patrol Coastal Griffin Missile System was integrated on a Cyclone-class patrol ship, where the missile was successfully employed against remote-controlled boats simulating a threat to the ship. Guidance: Semi-active laser homing, Global Positioning System or Inertial navigation system. ↑ 10.0 10.1 10.2 10.3 10.4 10.5 10.6 10.7 "Raytheon’s Griffin Mini-Missiles". Defense Industry Daily. http://www.defenseindustrydaily.com/Raytheons-Griffin-Mini-Missiles-07182/. Retrieved 27 December 2011. ↑ Warwick, Graham (13 June 2008). "Small Raytheon Missile Deployed On Predator". Aviation Week. http://www.aviationweek.com/aw/generic/story.jsp?id=news/GRIFFIN061308.xml&headline=Small%20Raytheon%20Missile%20Deployed%20On%20Predator&channel=defense. ↑ "Navy boosts Persian Gulf patrol craft force". http://www.navytimes.com/article/20130703/NEWS/307030021/Navy-boosts-Persian-Gulf-patrol-craft-force.